If recent marketing news has made one thing clear, it’s this: Mobile is non-negotiable. A growing number of us are using mobile as our primary device for accessing the internet -- over a quarter of us interact with our smartphones more than any other object, or human being, for that matter. And content, in kind, has to fit that format, whether we’re consuming it or discovering it for the first time. Brands are starting to respond to that. Just last week, for instance, Google announced that non-mobile friendly pages will be ranking even lower next year. Apps will be especially impacted most by this increasingly widespread mobile use. The push notifications we receive on our devices will play a vital role in the information we come across, and if we choose to consume it. Many of us are already receiving information that way. 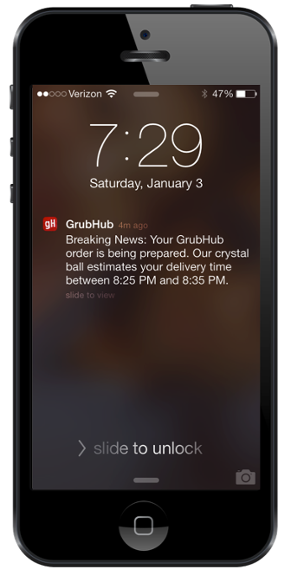 In 2015, the average opt-in rate for push notifications was 49.8%. But those messages have to be optimized -- otherwise, brands risk being ignored or forgotten. Why is that, exactly, and how can it be avoided? Read on to discover the types of push notifications your users actually want to receive -- and how each one will benefit both of you. 1) The ones that are encouraging -- not shaming. Once upon a time, I had an activity-tracking bracelet. It was connected by Bluetooth to my phone, where I could use an app to log workouts and meals. One day, when I hadn’t worked out for a while as a result of having the flu, I received a push notification from the app. I can’t be the only one who would feel a little bit judged by a message like that, even if it was automated. I mean, was this app serious? I had the flu! No wonder health and fitness app have the lowest opt-in rate for push notifications -- they shame their users. That doesn’t have to be the case -- nor is it, for every health and fitness app out there. 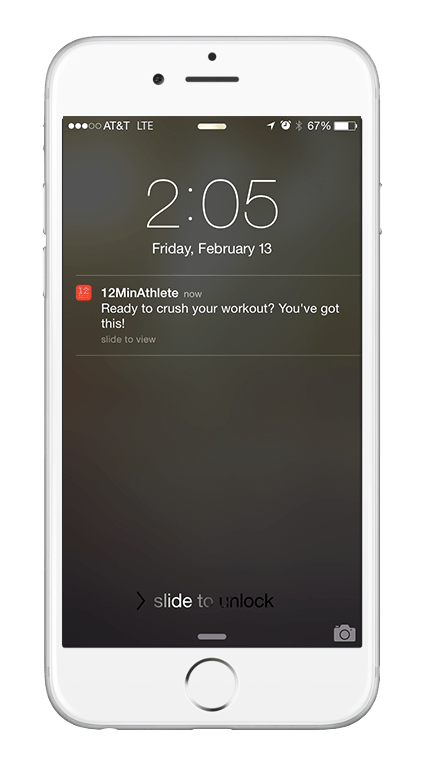 There are some, like 12 Minute Athlete, that let users schedule their own workout reminders. (And if you’re sick, you don’t have to schedule any.) Then, when it does come time for your workout, you get a notification that encourages you, instead of making you feel guilty. Most health and fitness apps are traditionally created with a somewhat shared goal: To help their users get better at doing something. And one of the most ineffective ways of doing that? Feeling bad about not doing it. In fact, research has shown that it’s self-compassion and forgiveness that make us correct negative behaviors -- not guilt. Consider giving your users the option of taking a break. That can be applied to a variety of app categories: Health and fitness, dating, or online shopping. Let them determine how long they want that hiatus to be -- and feel free you set your own parameters for how long that can actually go on. Then, send a push notification to ask them if they’re ready to come back. That will remind them to launch the app, keeping them engaged after they’ve stepped away. 2) The ones that make life a little easier. I’m one of those people who has to put everything in my calendar. But the one thing I never seem to remember scheduling is an online check-in for my flights. That’s why I absolutely love it when airline apps remind me to check in 24 hours in advance -- and maybe that’s one reason why travel and transportation apps have the highest push notification opt-in rate. Many airlines notify passengers to check in via email, but let’s face it -- with text messages outweighing email as the preferred method of communication by 23%, chances are that we're looking at these quick notifications more than we're checking our email. JetBlue is one airline that does this particularly well. Like clockwork, I always receive a friendly little note on my screen -- “Hey there. It’s time to check in for your flight” -- exactly 24 hours before I’m scheduled to take off. It’s one less thing that I have to remember to do and, therefore, these particular notifications are adding value for me. Ask yourself that question before you write copy for a push notification: How can we frame this in a way that creates value for the user? You’ll be glad you did -- users who opt-in to push messages average three times more app launches than those who opt out. 3) The ones that know where its users are -- in a non-creepy way. 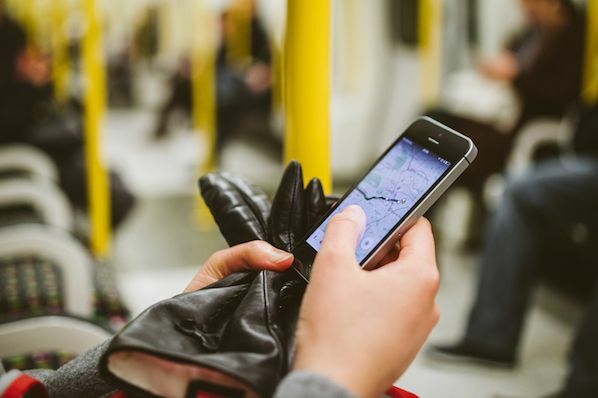 When Localytics asked mobile users which type of push notifications they preferred the most, 34% responded with “a special offer based on my location” -- the third most popular kind. And why not? If you’re already out, you might as well treat yourself with that special discount, right? 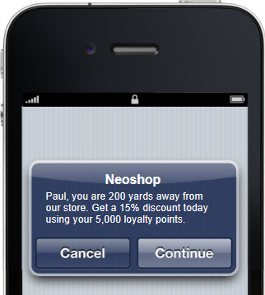 Take this notification from Neoshop. It’s personalized on two levels -- it includes the user’s first name, and it lets him know that there’s a shop location nearby where he can use some of the credits he’s accumulated. Knowing where your users are and responding in kind accomplishes two things: First, it lets them know that you’re paying attention. You’re not watching them in a Big-Brother-ish way -- you’re looking out for them, and for opportunities around them. That’s another way to add value for your user. Instead of asking them to go out of their way to engage with you, you’re creating an opportunity when it’s convenient to them. That makes it easy for someone to find a reason to launch your app -- and to remember that they have unused rewards. 4) The ones that get people excited about something. There are also occasions when you might not be where you want to be -- like a warm beach in the middle of winter, for example. And, there are times when a push notification can help you get there -- like with a cheap airfare alert. 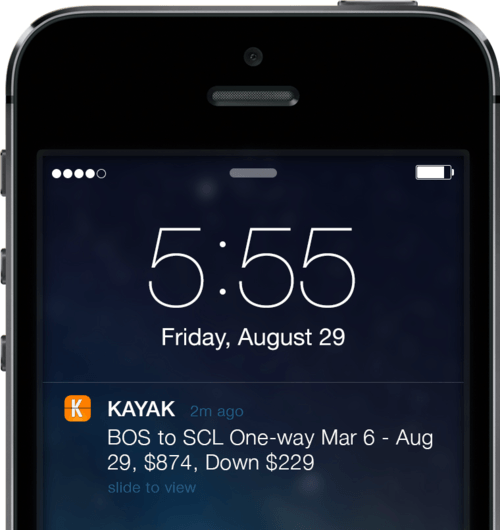 Kayak, a travel search site, allows its users to set their own notification criteria -- based on destination, date, or popular places to travel -- and receive an alert when the price for any of those trips drops below a point of their choosing. There are few things that thrill me more than a good deal on airfare. And when it’s Kayak who lets me know about that deal, I associate that brand with my excitement. And that makes sense -- "a special offer based on my preferences" was the #1 preferred type of push notification in 2015. The reward is twofold: Not only are your users receiving information that’s perceived as a great deal, but it’s the result of something they were able to dictate. There’s a return on their investment in your app -- and they got to call the shots on what that return would look like. It’s thoughtful, right? And since 52% of us prefer gifts that are truly considerate in that way, it seems fitting that we would respond well to brands that behave accordingly. So think about what’s really going to excite your users. Let your audience determine what they deem rewarding by letting them customize preferences. 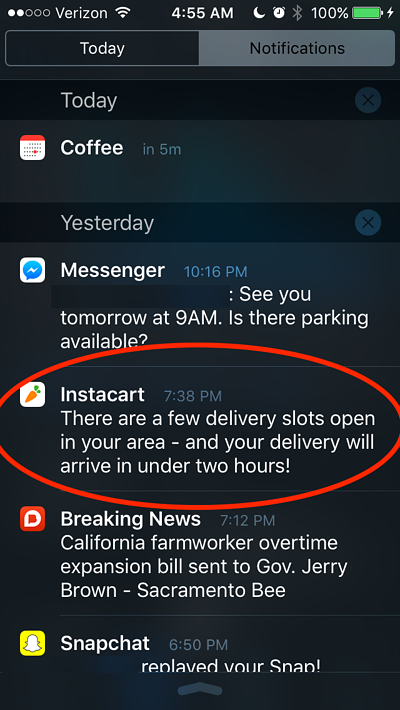 When you plan your push notifications, having that information will help craft the message that your app is going out of its way to benefit its users. 5) The ones that alert people to what matters to them. It might seem like we’re a bit overwhelmed with bad news these days -- so much, in fact, that WNYC put together a Breaking News Consumer’s Handbook. As much as we like to stay informed, we also like the opportunity to tune some things out. But what about the rest of what’s happening in the world -- the stuff that we want to stay in the loop for? At risk of sounding cliché: There’s an app for that. Instead, the app uses push notifications to alert listeners to live broadcasts, encouraging them to tune in. 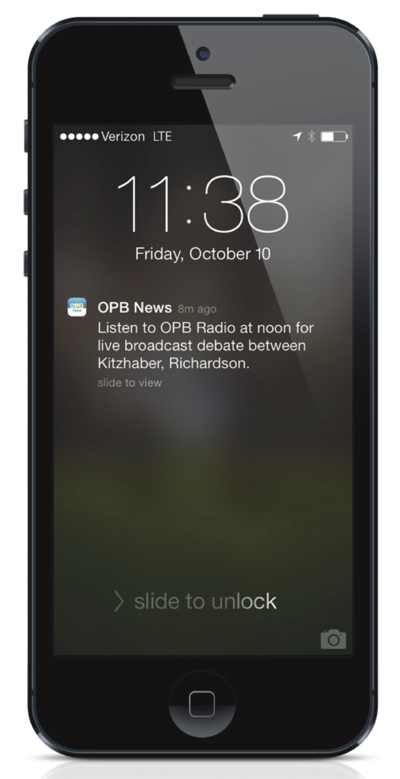 And it works -- after sending these alerts, OPB saw a 483% increase in users listening to a specific radio broadcast. 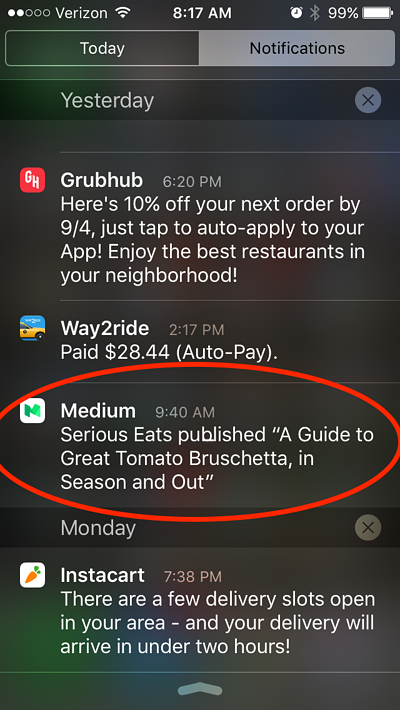 Medium, an online publishing platform, uses push notifications in a similar way. Users can receive an instant alert when someone they follow publishes a new post -- and can decide if they want to Medium to select the top five posts of this kind, instead of receiving a notification every time something new is published. And if they want, users can also opt to receive notifications for stories that Medium recommends, based on their reading history. Breaking News is another app that has quite a few content customization features. It lets users decide what they want brought to their attention, and when they want to hear about it. 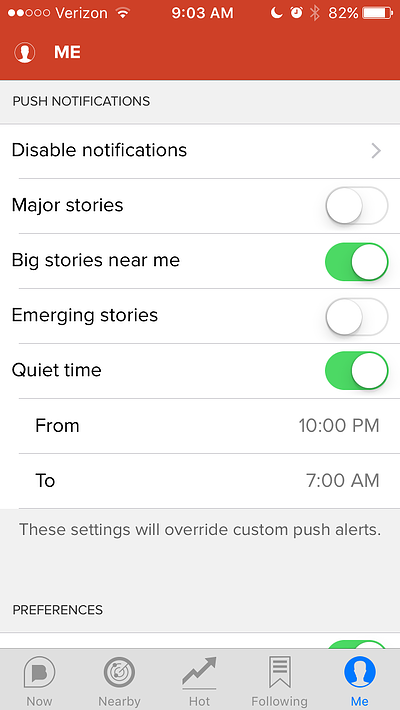 There’s an option to disable notifications for “major stories,” as well as a way to set “quiet time,” when no news alerts will be sent. 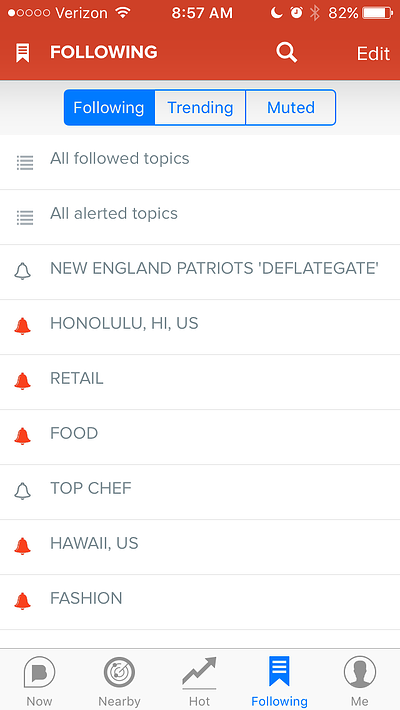 But here’s where the real value comes in -- the features that allow users to pick the topics they want to know about. That level of personalization is a tremendous asset to your audience. In fact, users are three times more likely to respond to a notification that directly affects them, as opposed to an alert that might have been sent to everybody. Depending on what sort of information is shared by your app, a best practice could be to let users pick and choose what they want to know about. And, instead of only giving them the chance to turn off notifications completely, let them choose a time of day when they don’t want to be disturbed. 6) The ones that help people pick up where they left off. You’ve walked into a room with an intention. But then, something distracts you. The phone rings, someone’s shouting your name for your attention, and by the time that distraction has passed, you’ve forgotten why you walked into that room in the first place. That scenario often plays out when we’re using apps. Let’s say I’m using a grocery delivery app to place an order, when someone sends me a text message. If leave the app to respond, I’m probably going to forget what I was doing before that message came in, and neglect to finish my order. That’s no surprise, since studies now reveal that we have a shorter attention span than most goldfish -- largely due to smartphone use. How convenient! Not only do I now remember that I need to order my groceries, but I don’t have to wait that long for them to be delivered, either. This example goes back to the idea of making life easier for your users. But in this case, instead of being reminded of a specific, salient event -- like a trip or flight somewhere -- the app is helping me stay on top of my day-to-day tasks and responsibilities. How busy are your users? Is this alert going to help them, or just distract and disrupt them? Answering those questions will help you prioritize the alerts you want to send to your users, and limit the amount of overload they perceive from your app. 7) The ones that keep people posted. When you combine the cultural pervasiveness of hangriness with the fact that more and more of us are ordering meals online (by 2020, it’s predicted that mobile ordering will be a $38 billion industry), the outcome is as follows: We really, really want to know when our food will arrive. That’s why it’s smart for what Business Insider calls “aggregators” -- platforms like GrubHub and Eat24 that allow users to order online from dozens of different outlets -- to incorporate a live delivery update feature, to let us know when our food is on its way. It’s important to note that we’re becoming a species of instant gratification -- 43% of us think it’s unacceptable to take more than 10 minutes to respond to a text message, for example. And whether we like that direction or not, it’s important for businesses to adapt, especially in the mobile sector. Am I making my users wait longer than they want or should have to? Am I keeping my users posted about what they’re waiting for? Am I updating my users to the point that I’m becoming disruptive? Do my users have a way to reach me if they need more information after I update them? Those last two points stress the importance of striking the right balance with push notifications. Share just enough information so that your users aren’t left completely in the dark while they’re waiting. And if they need more details, make sure there’s an easy way for them to get in touch with you. Amazon Web Services: Among Amazon's many developer tools is its SNS Mobile Push Notifications feature. Like other platforms of its kind, this feature allows notifications to be sent individually (to one person at a time), or to multiple users at once. OneSignal: OneSignal is a notification service that's used by several apps that need to provide real-time updates to their users -- think Uber ("where's my ride?"). It also allows A/B testing, so that marketers can send two different messages to samples of user groups and see which one performs better. When it comes to creating push notifications, there’s an unspoken golden rule: Alert others as you would like to be alerted. These notifications are absolutely crucial to your mobile marketing strategy -- users that enable them are 171% more engaged with the app than those who don't. But choose them wisely. They aren’t redundant or disruptive to your users. They keep your users informed of the things they want to know. They’re thoughtful -- they keep an eye out and make life a little more convenient for users, without seeming overbearing or clingy. They encourage users -- and don’t shame them. How do you use push notifications? Share it with us in the comments.